In this we will discover that Hope for the Future is based on certainties. The most important is the unchanging character of God, and the eternal nature of His Word. ^^Introduce people to Spiritual reality. Your study group could be the stepping-stone for others coming to faith. 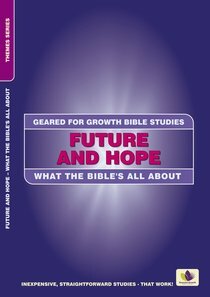 About "Future and Hope (Geared For Growth Bible Studies Series)"
Studies, which will help you, treasure the psalms with its outstanding variety of issues that dealt with in a beneficial way! Deals with topics such as grief, doubt, oppression, anxiety, death, repentance, restoration, joy, thankfulness %26 praise..
Meet weekly in a small group, share your answers and be enriched as you learn from others. You will be challenged to put God's Word into practice. Others will feel the impact as you obey, grow and mature. Introduce people to Spiritual reality. Your study group could be the stepping-stone for others coming to faith.